Writing about barrel-aged cocktails as much as I have over the past few months, it dawned on my this summer that, though it sounds like a complex undertaking, making such a concoction is actually something anyone can try at home. All you need is a barrel and a lot of liquor. Everyone I knew who was doing it seemed to be using barrels from Tuthilltown in the Hudson Valley. So I contacted the distillery and acquired a three-gallon barrel—which is about the sweetest little thing you ever saw. Adorable baby barrel. I then contacted Jeffrey Morgenthaler, the Portland bartender who got this trend rolling when he began selling barrel-aged cocktails at Clyde Common last fall, and then reported on his experience on his blog. I asked him what cocktail a novice should start with, and he named the Negroni. I basically followed his recipe, using Beefeater gin, Cinzano sweet vermouth and, of course, Campari. I had been leaning toward Dolin, since I like the stuff. But Morgenthaler recommended Cinzano for "the classic Italian flavor." And then there was a delay, as it dawned on me that three gallons of liquor is more than you would think, and I'd need more than $300 to fill that tiny cask. Finally, last week, after paying umpteen necessary bills, I found myself with the necessary extra cash on hand. 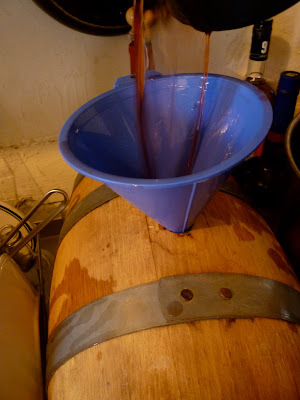 I mixed all the liquor together first, as per Morgenthaler's directions, before funneling it into the barrel. I thought I was being rather sloppy, because drops of Negroni kept spilling on the counter and pooling on to the floor. But then I realized with horror that there was a leak! The cask was dribbling out Negroni on both ends. I panicked and quickly emptied the liquor back into the container in which I had mixed it. I was seeing red, and not just because of the Campari. I finally got all the booze together, and the barrel didn't even hold water! At that moment, I had to run out and pick up my kid from school. While there, I ran into a friend who is a homebrewer and vented my tale of woe. He suggested that the cask had dried out and the seams between the staves were not as tight as they once were. Perhaps if I immersed it in water. I went home and emailed Gable Erenzo from Tuthilltown and he basically echoed my friend's advice: put the barrel in my bathtub and keep topping it off with water until the leaking stopped, "which it should." I started the process in my kitchen sink, as it was more handy, soaking each side of the barrel and keeping the insides filled at all times. It seemed to be working. With each dip, the barrel leaked less. 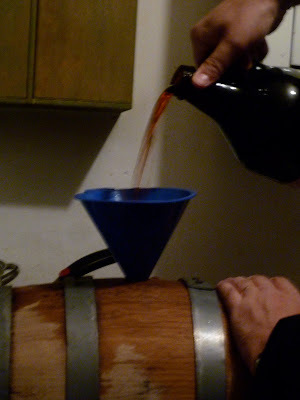 But when I put the dry, filled cask in a large dry bowl, there were always still a few drops that escaped. A half-hour dunking in a bathtub full of water finally did the trick. The barrel was tight as a drum once again. Back to the kitchen. I funneled the Negronis into the wooden vessel for a second time. No leaks at all this time. Mission accomplished. Strangely, though I followed Morgenthaler's recipe to the ounce, I had some pre-mixed Negroni left over. So I found a glass growler and funneled it in there. Morgenthaler, after all, had been inspired by Tony Conigliaro of London, who ages his cocktails in glass. I'll leave that container alone for a year or more, as Tony does, and see what happens. The barrel-aged brew, however, should be ready in a couple months. I will post again then. It's Angus from Brisbane, I am wondering if there is an exact science explaining why the three ingredients will marry better due to faster oxidation in the barrel as opposed to, say, in a glass decanter with a large surface. Loving your blog it's an inspiration on this side of the world. Angus: I'm not a scientist, so I can't answer with much authority. But contact with wood is going to alter spirits more quickly than glass because it has more in the way of flavor and color to impart. Glass is neutral, and won't impart flavor or color. I'm not saying they will marry better in barrel, however. I've tasted cocktails ages in barrel and aged in glass, and they were both superlative. But the marrying and deepening of the ingredients took far longer in glass (3 years). Thanks Robert I have a few ideas up my sleeve for a small barrel. Since a couple of aged manhattans (8 months old) at Colebrook Row, I've been eagerly following the development of this technique and I look forward to hearing about your negroni batch - wooded and unwooded. Thanks for the reply. I just made Bourbon Manhattan in 2 litre sherry cask barrel, aged for 4 weeks. It's taste delicious. It has real nice flavor. Question: Could you not skip the barrel altogether and insert charred oak staves (or chips, even) into a large, regular container? You could even regulate the oxidation and evaporation. Seems more economical and less messy than using a barrel - there's no magic in the shape of the wood, just the wood. Lindsay: I know this is just a home experiment, but I, like many purists in the distilling industry, am skeptical of the aging shortcut provided by oak staves or oak chips. I don't want my winemakers or whiskeymakers using such cut such corners to make their goods, so it only makes sense to me that I practice what I preach. And the barrel isn't such a pain when it comes down to it. Quite easy, actually.